In any home there are certain areas where daily clutter tends to accumulate. You don’t know quite how it happens, but it does. Often it’s the entrance area, where things get dumped when you arrive home or where you put things you want to remember to take with you when you leave. In some homes it’s the kitchen table, countertops, the dining room table, and so on. The first step is to go around your own home and identify the areas that act like a clutter magnet. If you share your home with others, it may be their stuff as well as yours, or it may be all their stuff and none of yours. Whatever the case, the way it slows and stagnates the flow of energy around your home will affect you and everyone else who lives there in some way, so it’s in your interests to do something about it. Clutter clearing these areas presents a different kind of challenge to other places in your home because it rarely stays that way. You roll up your sleeves, tidy it up, and a few days later, it’s started to fill again. Clutter, by definition, is unconscious, so the only way to prevent this is to consciously own the space and declare it a clutter-free zone. What is a clutter-free zone? A clutter-free zone is a place where you never put anything “just for now” because it doesn’t have a home, or it does have a home but you can’t be bothered to put it there. You make the extra effort to put it where it belongs. If necessary, make a CLUTTER-FREE ZONE sign and place it there to remind yourself and others you live with, until you all get the knack. You can still use areas such as your dining room table for other purposes (doing paperwork, etc) for a day, but then you pack it all away again and return the table to its clutter-free state so that you can use it for eating. If you share your home with other family members, some persistence may be required. I stayed at a friend’s house recently and watched as a 9-year old child arrived home, kicked off her shoes in the hallway, threw her jacket and bag on a chair, and left it all there for her mother to tidy up later. She’d never been taught any other way. But allowing children to live like this is doing them a great disservice. They will grow up to become the next generation of clutterers, with no idea how to organize their own home or manage their own affairs. You can start by introducing clutter-free zones, and then gradually expand this to other areas, such as tidying their own bedrooms. Untidy partners can be trickier to handle but as with all types of clutter, the underlying issues are the problem, not the clutter itself. Agreeing to specific clutter-free zones can be a very helpful first step towards resolving this. Here’s a lovely example of a clutter-free zone created by a woman who took my Fast Track Clutter Clearing online course and kindly gave me permission to share this. The bench had been a family dumping area for keys, wallets, phones, laptops, tablets, newspapers, food, anything taken from the garage and not returned, as well as assorted clothing, towels, hair accessories, and so on. At first the family didn’t take her seriously. 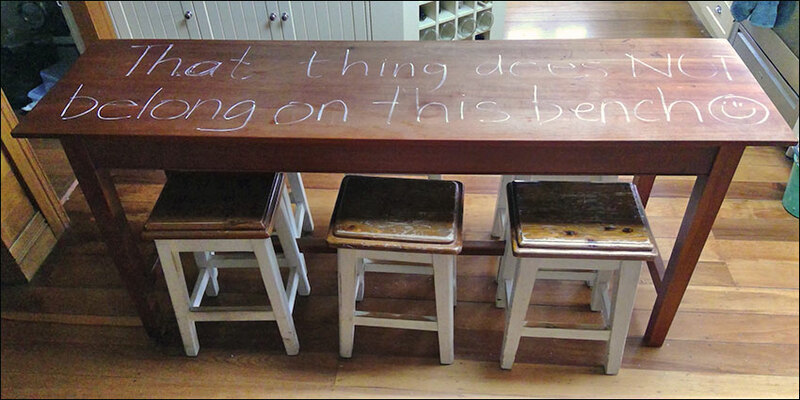 The husband left his watch on the table with an attached message, saying ‘Surely this is a wind-up?’ Then the son changed the message to ‘That s*** ABSOLUTELY belongs on this bench’. But eventually they got it, and no the area is clutter-free, bringing a much lighter and brighter feeling to the entire kitchen space. Like to read more articles like this? Subscribe to my newsletters to receive news, articles and information about upcoming online courses by email. And I promise you – no junk mail ever. Karen Kingston is a leading expert in clutter clearing, space clearing, feng shui and healthy homes. Her international bestseller, Clear Your Clutter with Feng Shui, has sold over 2 million copies in 26 languages. She is known for her in-depth, practical and perspective-changing approach. This entry was posted in Clutter clearing. Bookmark the permalink. Articles may be copied in part or in full providing copyright is attributed to Karen Kingston, a link to www.spaceclearing.com is included, and the content is used only for non-profit purposes. Written permission for any other kind of usage is required.